We see habitual behavior in every aspect of our lives, whether spiritual, physical, or emotional. Old habits are hard to break and new ones often harder to establish. The same is true when it comes to our homeschool habits. Whether you are a fledgling homeschooler or a veteran like me, each of us tends to steer our proverbial homeschool bus straight for that which is most familiar…textbooks. Because, being creatures of habit, we tend to teach how we were taught. But, let’s think about their original objective for a moment. Textbooks were designed to be convenient. They were meant to help teachers instruct a large group of students, roughly the same age, the same subject, at the same time, in the most judicious way possible. Each public or private school teacher has, in fact, only one textbook from which he or she has to teach. Yet, the first thing we do is load ourselves down with a busload of textbooks for every subject, grade, and child in our family. Is it any wonder we are soon ready to pull our hair out? Now don’t misunderstand, a textbook can certainly be an effective, useful, and even convenient tool to use when educating our children. But textbooks for every subject, grade, and child in our family? That’s where convenience ends and major, homeschool burn-out begins. Unit Studies simplify your life by enabling your whole family to study the same topic, at the same time, regardless of age. They accommodate various learning styles and abilities by incorporating an assortment of creative, hands-on, multi-sensory assignments. 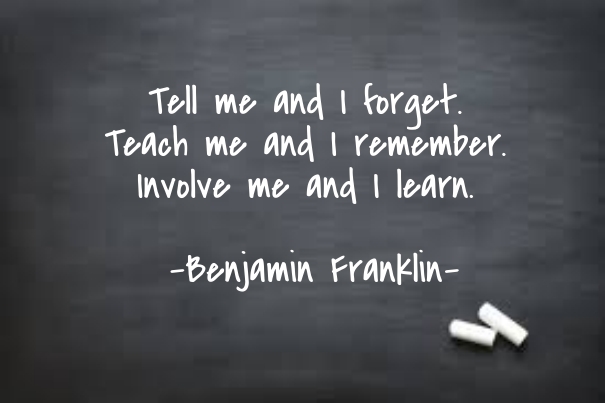 Due to their fun, experiential approach to learning, they also improve long-term memory of the material studied. What’s more, their flexibility gives you the freedom to do as much or as little as you like, as well as the opportunity to tailor your family’s educational needs and interests. Unit studies eliminate textbook clutter by building multiple academic subjects around one central theme. 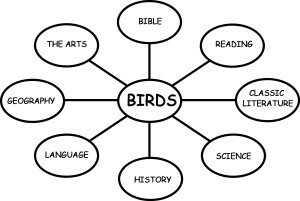 That means while you are studying birds, as in the illustration here, you can cohesively and sensibly connect Bible, reading, classic literature, science, history, language, geography, art, etc. to that theme. Of course, you’ll still need a math book for each child, resources for teaching early language skills, and your favorite go-to grammar resource. But the majority of your subjects can easily be integrated into your unit study topics, from early childhood through high school, without the added expense or chaos of multiple textbooks. So, are you ready to break free from old habits? Are you ready to start having more fun? If so, imagine for a moment you are a child again. Before you are two tables; each table represents a class. Resting on one table is a science textbook, fill-in-the-blank worksheets, and test forms. You flip through the book noting a brief chapter on birds when, suddenly, the other table catches your eye. Wow! That table is overflowing with homemade bird feeders, bird seed, and recipes for bird food concoctions. There’s a field guide, binoculars, colorful library books, and a biography about John James Audubon! His book, Birds of America, reveals hundreds of beautiful paintings! Ooh…there’s also a book that will teach you how to draw birds and a blank journal in which to record the many species you’ll discover while on a field trip. Alongside those are a documentary, a movie, and a CD that will help you identify birds by their songs. There’s also a Bible in which you’ll discover God’s careful attention to detail when creating birds. Yikes…there are even owl pellets that you’ll apparently dissect using rubber gloves and tweezers to determine its last victim! If you were a child again, which class would you choose? I’ve always been intrigued by the idea of unit studies, but the fear of time holds me back. Do you feel like you invest more or less time into the planning process of unit studies vs. traditional teaching? Thank you for your question. Because everyone in the family learns about many of the same subjects and topics at the same time, I have always found unit studies to be a huge time saver! Once-a-Week Unit Studies also save you time in that the prep work has already been done for you. When I was homeschooling I had to do all the prep work myself, so I took two weeks to research and plan between the end of one unit study and the beginning of a new one. During that “off-time” I had the kids complete only the three Rs. I love planning unit studies so for me it is exhilarating. If that is not something you enjoy or your time is more limited then I would suggest using an already prepared unit study, such as Once-a-Week Unit Studies. Either way, the fact that unit studies make homeschooling so much more fun for the whole family and teach children far more than a typical textbook can was reason enough for our family to choose them as our preferred method of teaching.